I'd tried one or two of these cheeses before, purchased at a natural foods store in the city - but this was my first time visiting the shop, which I had been dying to do since I heard about it earlier this month. It was so exciting to see the case full of all these nut-based cheeses! Since I decided a couple years ago to try avoiding dairy for health reasons, I have missed cheese more than anything else. Non-dairy ice cream is easy to find these days, but a whole spread of different cheeses like this is not... 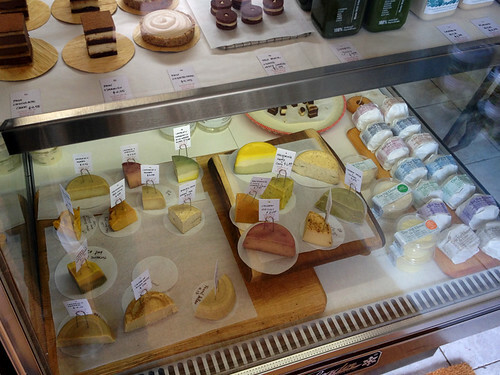 The shop also had some other snacks and desserts for sale, but I was focused on the cheeses. They're a bit pricey, but I picked two small chunks to take home and enjoy: cashew-tomato, and smoked-tea-cashew. I tried samples of a couple others in the store, including one with blue-algae which was intriguing. I LOVE Dr. Cow, but haven't made it to the shop yet; thanks for the insight into the shop. While I've been hearing a lot about it, I've yet to get a glimpse inside and I had no idea there were additional cheese flavors to be had- so exciting. A friend whose opinion and taste buds I highly respect has recommended The Non-Dairy Formula cookbook for cheese recipes, in case you're interested. There are SO many flavors! you will love it! 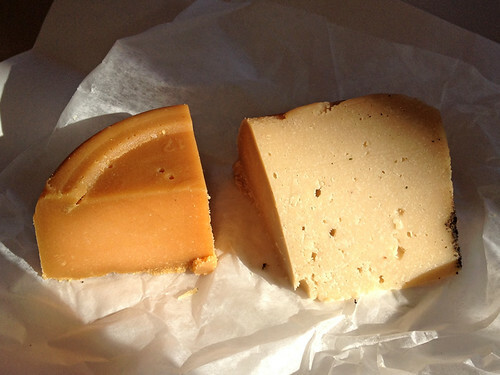 And thanks for the cookbook recommendation - I have tried a couple homemade cheeses so far, with mixed results. If Dr. Cow was not so expensive I would just buy a whole cheese platter there every week!